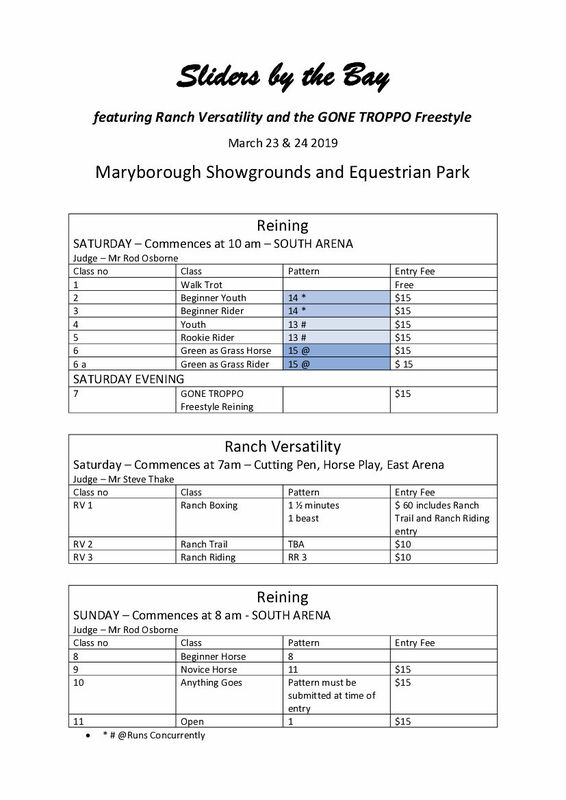 ALL COMPETITORS PLEASE NOTE: IF YOU ARE NOT A MEMBER OF THE CALLIOPE SLIDERS OR ANY OTHER AFFILIATE, RA or NRHA YOU ARE NOT COVERED BY OUR PUBLIC LIABILITY INSURANCE AND YOU MUST FILL IN A MEMBERSHIP FORM AND PAY THE DAY MEMBERSHIP FEE AT THE TIME OF ENTERING. Numbers to be worn by all competitors. Numbers will be supplied by the club and will need to be returned at the conclusion of the show. Tie for first. – in the event of tie for first place those tied will have the choice of either a run off or deciding who receives the winning prize by a toss of the coin. If one party chooses to run off but the other party declines to participate this will be considered an acceptance of second place. If tied after the run off the decision will be decided by the toss of a coin. All other places will be shared, and prizes decided by the toss of a coin. WALK/TROT -Walk/Trot pattern, two hands, any bit, any gear. Beginner Rider/Beginner Youth – Modified pattern. Horse to be ridden one or two handed but must remain consistent throughout the pattern or a zero score will apply. Any approved bit, any gear. Restricted to any rider that has not won 3 events at an affiliated reining show. Youth – Under 18. Full Pattern. One or Two hands regardless of the age of the horse, any gear. Novice Horse. Full pattern, one handed in a shank bit or two handed in a snaffle. Western attire, western gear. Anything goes. Open to any rider on any horse regardless of age or experience. Rider mat ride one or two handed but must remain consistent throughout the pattern or a zero score will apply. Green riders/horses may perform a simple lead change without penalty. Open Horse. Full pattern, any gear. Any horse. Snaffle bit two handed, shank bit one handed and must remain consistent throughout the pattern. Left circles at the north end of the arena, right circles at the south end. Circles and turnarounds at the first ½ of the hour. Rundowns and stops the second ½. Please move to the centre of the circle for spins. Please be aware of your surroundings and be mindful this is a show that will have many participants new to the sport and remember just how intimidating the warm up pen can feel for those who aren’t accustomed to our sport.